Taylor Canfield’s USone Sailing Team has stepped out to a 2-1 lead over Johnie Berntsson’s Swedish crew in the Final of the 68th Argo Group Gold Cup. The winner of the match will be the first to score three points and will earn $30,000 of the $100,000 prize purse. The two matches completed a frantic Friday at the venerable match racing regatta. The day began with the four pairs in the Quarterfinals. After a break for lunch the Semifinals were conducted followed by the beginning of the Final and Petit Final. Just as the racing was wrapping up shortly before 6:30 pm a 25-knot squall came ripping across Hamilton Harbor, putting an exclamation point on the day. 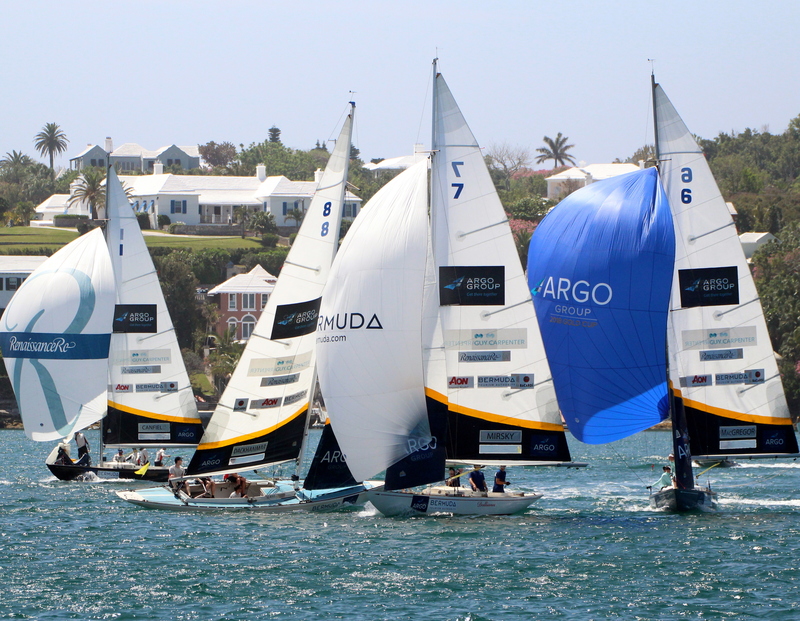 In Race 3, as both boats approached the windward mark on port, she was penalized for failing to keep clear. She decided to unload the penalty by tacking and bearing away onto the run, but that allowed Canfield to jibe away and open a three-boat length advantage that he wouldn’t relinquish. In the deciding race Berntsson led Mirsky onto the racecourse. Mirsky initiated a tacking duel that saw the crews tack seven times halfway up the first leg. Berntsson just led around the windward mark and the pair was nearly even as they began the second upwind leg, but Berntsson was able to find better pressure on the right side of the racecourse to extend to his lead.